Central Bordeaux : grey lines are tram routes. Thanks to the top-quality wines produced in the local vineyards, Bordeaux is a city whose name, after Paris, is more recognisable than that of any other French city. The great port city - a popular stopover for cruise liners - can trace its origins as a capital city back almost 2000 years. In the year 70 AD, Bordeaux replaced Saintes as capital of the Roman province of Gallia Aquitania. Apart from some periods of conflict following the breakup of Roman Gaul, Bordeaux has remained the biggest city, and for most of its history, a capital city. firstly it was the independent Duchy of Aquitaine, then for three centuries Aquitaine was a possession of the Kings of England. Since the end of the Hundred Years' War, it has been part of France. From the 1960s to 2016, Bordeaux was the capital of the region of Aquitaine. Since 2017 it has become the capital of a larger area of southwest France called New Aquitaine, or Nouvelle Aquitaine, that stretches from the Limoges area in the north, as far as the Spanish border in the south. In 2007, the central area of old Bordeaux, known as the Port of the Moon on account of the crescent-shaped bend in the river, was designated a Unesco world heritage site. It is one of the finest unspoilt eighteenty-century cityscapes in the world. Like the old centre of Lyon, the historic centre of Bordeaux, where many of the streets are now closed to traffic, is remarkable not so much for individual monuments (though there are plenty of these to see... see Tourist attractions below) as for the historic city as a whole. The centre of Bordeaux has everything that one would expect of a vibrant modern city, shops, services, big stores, cinemas and lots more, but it has them in the framework of an architectural ensemble of stone buildings most of which date back to well before the twentieth century. The only building features that break the city's five-story skyline today are the towers of the cathedral, city gates and other churches. A view of the central area of Bordeaux from across the Garonne is rather like a view of London from across the Thames in some eighteenth century print.... without the sailing ships. The harbour-side buildings along Bordeaux' s waterfront are set back about a hundred metres from the river. In the past the area was occupied by all the activities of the port; stores, offices, warehouses, cranes, and a roadway running the length of the port. Ocean-going merchant ships vied for spaces to tie up. Today all but the roadway has gone.. and the trams have returned. The rest of the space between the city and water's edge is a long promenade with pedestrian areas, water features and gardens; the only ocean-going ships that tie up are cruise liners. The Place de la Bourse - Stock exchange square (photo top of page) is a crescent of fine 18th century buildings facing the waterfront. The Cathedral - A large late gothic cathedral, whose bell tower, the tour Pey Berland, is separate from the cathedral itself. Visitors who climb the tower are rewarded with a breathtaking view over old Bordeaux. The Stone Bridge. Bordeaux's oldest road bridge across the Garonne. Built in the mid nineteenth century, it has 17 arches and is 487 metres long. The Grand Theatre. Bordeaux's historic theatre is the only surviving example in France of an 18th century theatre complete with its interior. The waterfront. A long pedestrian area along the edge of the River Garonne, very popular with local residents and with visitors. In particular admire the Water Mirror, in which the buildings of the Place de la Bourse are reflected. The Fine Arts museum. Bordeaux's Musée des Beaux Arts is one of the larger provincial art galleries in France, particularly known for its collection of French and Dutch art. It includes works by Van Dyck, Reubens, Titian, Chardin, Delacroix, Corot, Boudin, Bonnard, Matisse and others. Porte de Cailhau - Built in 1495, the Cailhau gate is the oldest of the surviving former gates of the old fortified city of Bordeaux. St Michael's Basilica - 14th to 17th century flamboyant gothic basilica - the largest church in Bordeaux. Its 114 metre spire makes it the second tallest church building in France . Listed by Unesco as part of the Santiago de Compostella pilgrimage route from Le Puy. 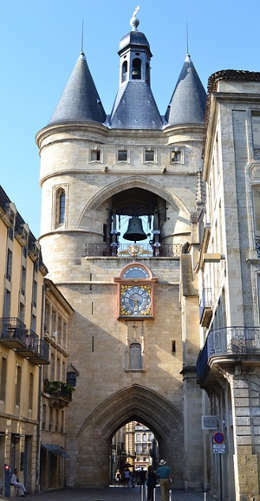 Grosse cloche - the Big Bell - Late medieval (15th century) municipal clock tower and bell tower standing where there was once a gate to the old city. The current bell and clock both date from the 18th century. The bell weighs 7.75 tonnes, and is rung at midday on the first Sunday of each month. The Bordeaux Wine and (wine) trade museum. (just north of the central area). Located in old Bordeaux, this museum is a more authentic experience than the out-of-town Cité du Vin . Located in cellars close to the old wine wharves, and run by a wine history association, it tells the story of Bordeaux wine. Visits include wine tasting. Musée d'Aquitaine. the Bordeaux local history museum. Tells the story of Bordeaux from prehistory to today, including the story of the port of Bordeaux and transatlantic trade. Eglise Notre Dame - One of the finest ornate baroque churches in France, particularly the exterior. The department of Gironde, of which Bordeaux is the capital, is most famous for its vineyards.These are to be found on either side of the Gironde estuary to the northwest of Bordeaux, and also to the west of Bordeaux in the valleys of the Garonne and the Dordogne. Médoc 40 km northwest of Bordeaux, to the south of the estuary. Médoc is home to the most prestigious of the Bordeaux estates. Its Grands Crus, such as Château Margaux, are among the most expensive wines in the world. Saint Emilion, Another top wine producing area, east of Bordeaux. The little town of Saint Emilion, with its steep cobbled streets, wine merchants, and medieval "monolith" (underground) church; is a Unesco world heritage site. Libourne - small town 40 km east of Bordeaux, at the upper end of the tidal reaches of the Dordogne. Historic city with medieval gateway and attractive market square. Citadelle de Blaye. 50 km north of Bordeaux. Standing guard over the Gironde estuary north of Bordeaux, the citadelle of Blaye is one of the major locations of the Unesco "Vauban" world heritage sites. A classic example of late 17th century military fortifications. The château de Roquetaillade near Langon, 50 km southeast of Bordeaux. The impressive exterior of this 14th century fortress is more or less authentic, but the interior is pure 19th century gothic revival, by Viollet-le-Duc. Arcachon. Bordeaux's seaside resort, on the Atlantic coast. The bay of Arcachon is popular for sailing, and just near the town is the Dune du Pilat, Europe's largest sand dune.. Zoo de la Palmyre On the north side of the Gironde estuary, at Royan, towards the mouth, the Palmyre zoo is one of the best in France. Click here for a ► choice of hotels in Bordeaux at best online rates, and the About-France.com hotel selection for Bordeaux. By air Bordeaux airport is well served by direct flights from the UK and Ireland For details see Fly to France. By train Bordeaux is accessible by direct high-speed trains from Paris Gare Montparnasse in about two hours. It can also be reached by direct train services from Biarritz, Toulouse, Marseille, Strasbourg and Lille. For timetables and online tickets, see Trainline.com . By car Bordeaux can be reached by car from Calais in between 8 and 9 hours via Rouen and Tours, and in 6h30 hours from Le Havre, via Le Mans and Tours. Main sites: The historic 18th century city centre, the Grand Theatre, the cathedral, the city art gallery, the wine museum, the waterfront, the old city gates. Well rated four-star hotel in the old city, close to the Tourist office. Private parking available - daily charge. Well reviewed classic three-star hotel near the centre of Bordeaux. Secure public parking available nearby - daily charge. Smart modern 2-star hotel in 19th century building near the station. Private parking available nearby - daily charge. Ibis budget hotel close to northern ring-road exit 4 on A630. 250 metres from tram stop on line C. Free onsite parking. Photo panorama of Bordeaux at dusk, by Guillaume Flandre.